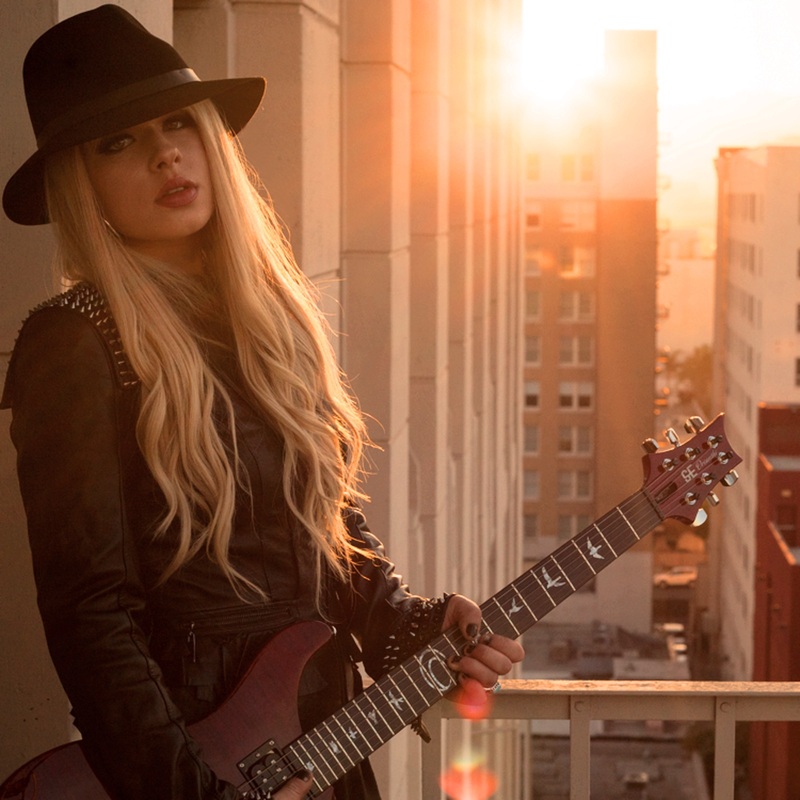 Orianthi knew when she picked up a guitar at the age of 6, her life would never be the same. Her instant affinity for the instrument quickly grew into a full-blown love affair. Growing up in a Greek family in the southern Australian town of Adelaide, she was already familiar with the piano, which she began to play at age 3. Her father had played in a Greek band and always kept plenty of guitars around the house. The day she was introduced to an acoustic guitar was the day she knew what her life’s passion would be. Not many people discover their destiny so early. She was special and determined. She began to scour her dad’s record collection which included many talented guitarists who were also quite accomplished songwriters, including Jimi Hendrix, Eric Clapton, Santana, BB King and many others. His eclectic tastes exposed her to a wide variety and she developed an appreciation of many different genres. Carlos Santana toured through Oz again when she was 18. Four years previously, Carlos had been sent her first CD, Under the Influence recorded at home when she was only 14, and he invited her to his soundcheck where she jammed with him. He was so impressed that he invited her to join him on stage where she played for 35 minutes and took a solo in front of her hometown audience. Carlos sent footage of her playing with him in Adelaide to Paul Reed Smith in the US, and in 2004 she was invited by Paul to travel to California for the first time to play at NAMM (a music convention). By the age of 20, after honing her songwriting skills with encouragement from her idol and mentor, Steve Vai and some of Australia’s finest song-writers and including Phil Buckle (John Farnham), she was ready to branch out from the cover band and do her own music. In 2005, Orianthi recorded her second independent CD, Violet Journey, playing not only lead guitar but also keyboards, bass guitar and drums on a number of tracks. She was seen by a Universal Records A & R at a NAMM show in early 2006 she signed a major record deal with Geffen and moved to the US later that year. All these experiences have now given her the freedom, credibility, and confidence as an artist to make the kinds of records she wants to make. Her eclectic style and versatility belie an exciting and varied career that continues to grow and expand and defies the tendencies of an industry quick to pigeon hole an artist into one linear direction. She found a kindred spirit in producer Dave Stewart (Eurythmics, SuperHeavy). Together they recorded Heaven In This Hell released March 12, 2013. The album is melodic, riff heavy rock, energetic blues, and a sprinkle of country and pop. “We were able to record with musicians I respect, creatively exchanging ideas and playing together live in the studio…the way I want all my records to be made. Dave is my producer but also a friend and collaborator. We had a lot of fun jamming and hashing out a variety of songs and sounds until we found the grooves that inspired us, “ said Orianthi.